Peripheral neuroblastic tumors (pNTs) including neuroblastoma, ganglioneuroblastoma, and ganglioneuroma are composed of biologically favorable and biologically unfavorable group. Tumors in the former group can show spontaneous regression or tumor maturation. In contrast, those in the latter group are often aggressive and refractory to treatment. Molecular/genomic characteristics of these biologically different groups and their prognostic impacts are described in this chapter. 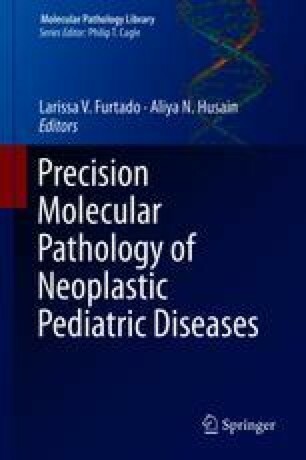 After discussing the risk-grouping system for pNT patients, recent progress of molecular pathology in precision medicine especially for children with high-risk neuroblastomas is summarized. The progress of pathology research in this disease also includes an establishment of a new concept, MYC family-driven neuroblastoma (including large-cell neuroblastoma) defined by augmented expression of MYCN and/or MYC protein of neuroblastic cells.